I have a really bad habit of making separates that match back to absolutely nothing in my closet. Am I the only one with this problem? And that is one of the many reasons I love making dresses – the issue does not exist! This sweater was finished 11 months ago, yet this is the first time I have worn it. Which is absolutely ridiculous! I simply adore cables! They look so complicated, but the pattern is so easy to follow, and the actual cabling only happens every few rows. 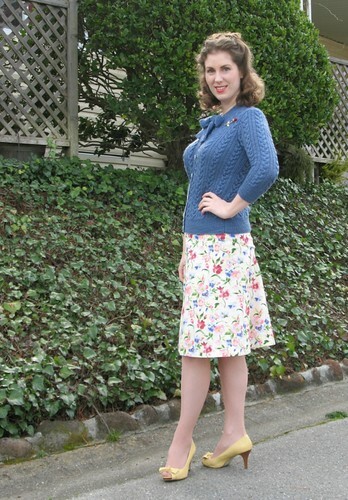 The skirt is also one of those orphaned projects that just did not work back to anything I own. Until I realized that this sweater was just perfect. And seeing how it is made of wool, it makes wearing a cotton skirt in February a little more comfortable! It is actually a Rachel Comey design from Vogue (read: "modern"), to which I added a full seven inches. I am continually seduced by the small amount of yardage that are required by these contemporary designs. However, once I alter the garment so it is long enough for my comfort level, the yardage requirements are no longer as wonderful as I originally anticipated. This outfit is continuing the early Spring theme. 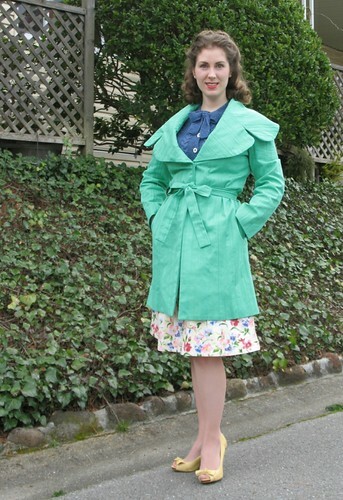 And with the backing of Punxsutawney Phil, I feel quite certain that many pastel colors are in my future. I so know that feeling which is why my New Year resolution is to only make/buy items which go with something in my wardrobe. in fact I am starting micro capsules within my wardrobe to keep some variety yet still be able to mix and match a bit better. 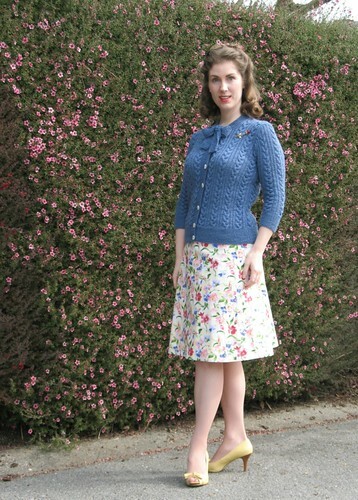 Love the skirt and the sweater, but my favourite is the jacket. It looks beautiful. You're not alone at all, I've bought plenty of separates over the years that didn't really seem to go with much else that I already had. I've gotten better at not doing this in recent years, but still do it sometimes and don't see it as a bad thing per se. Sometimes its fun and inspiring to have a few pieces that are standalone gems unto themselves. You continue to blow my mind! That coat is phenomenal!! 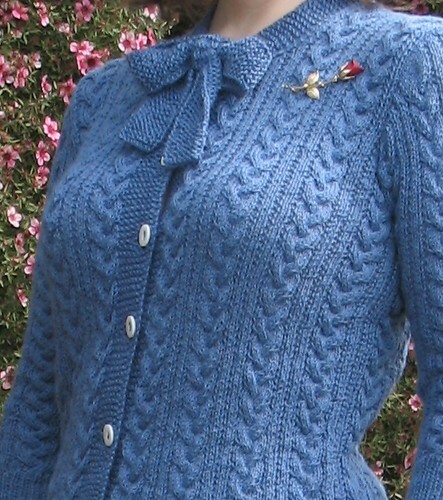 And that sweater is adorable and what a delightful color as well! I do that ALL the time! Probably because I have this problem with collecting prints that I love but don't necessarily go with anything. I get ridiculously excited when I finally make a top that matches a lovely print skirt that's never been worn! Your sweater is amazing. I don't knit, so it looks like the most complicated thing in the world. Now what about the jacket/coat you're wearing? What a great collar! Is the fabric a cotton suiting? It has an interesting texture. It is reassuring to know I am not the only one! 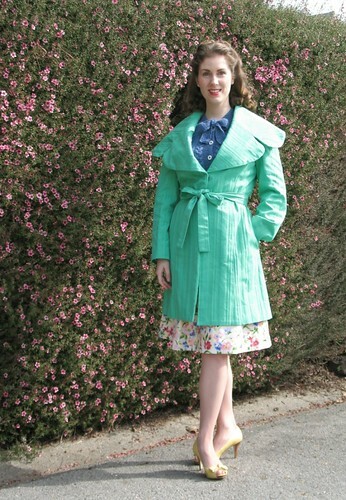 And the coat fabric is a cotton twill - good catch, Katrina! It seems that I'm not the the only one, nor are you, who makes/collects mismatched separates. I love prints and never seem to buy fabrics that work with them. 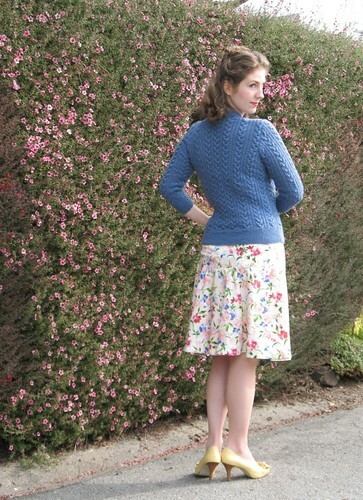 Your cardigan is lovely and works so well with your skirt. I guess that's two less orphans. Very pretty. 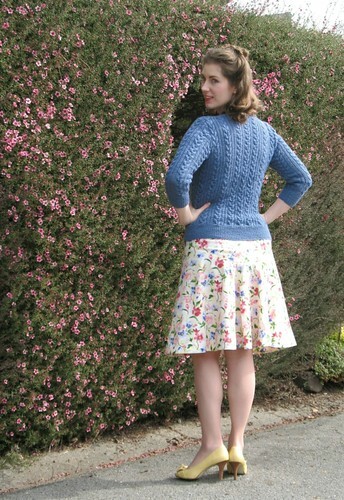 The sweater and floral skirt look perfect together. This is a breath of Spring! Wow, that trench coat is amazing. Love the collar. I also make too many separates that don't go with the rest of my clothes. I am hoping someday I will have so many this problem will be over!